Zone e lire (Free zone) is a highly successful TV talk show, broadcast live every Friday evening from Studio 2 of TV Klan, on of Albania’s major television broadcasters. Zone e lire, hosted extremely competently by journalist Arjan Çani, provides in-depth coverage of the latest, most topical local and international political, social and cultural events. Guests are politicians, artists, authors and journalists, who are key players in these events directly or indirectly. 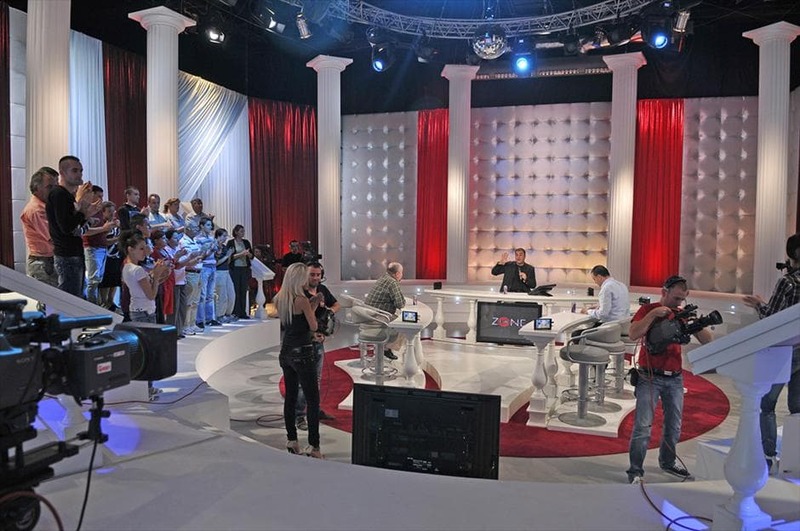 Fest Service was commissioned to design and install the lighting rig for the talk show, produced in TV Klan’s Studio 2 with an eye-catching set design reproducing a Greek temple. The set-up includes over 100 D.T.S. fixtures, including XR1200 WASH and XR2000 SPOT moving head units, LED FOS 100 FULL COLOUR LED bars and DELTA 7 FULL COLOUR B high-power LED fixtures. The lighting is installed on two concentric truss rings suspended above the “temple” to illuminate musical performances alternating with the show’s interviews, as well as being flown from the ceiling and installed on the floor along the perimeter to colour the set and backdrops.